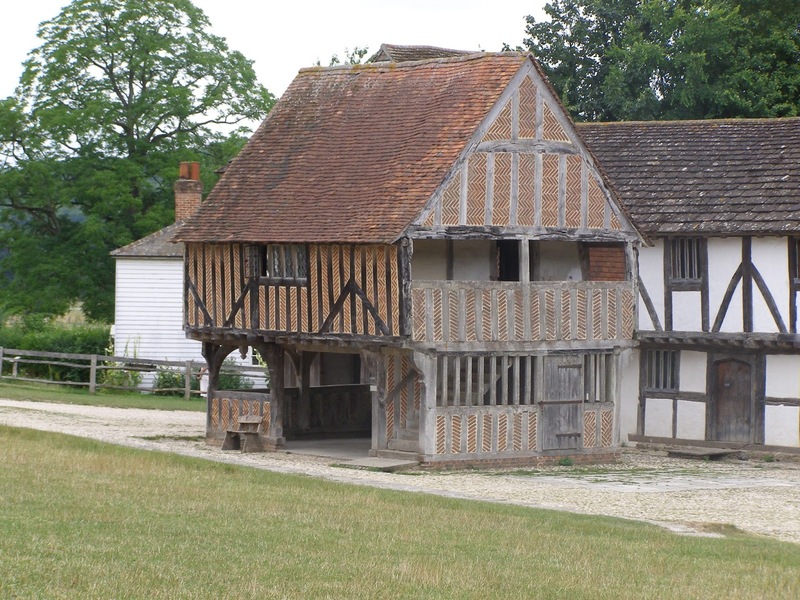 The History Girls: Were there once ships on the River Meon? Titchfield, in Hampshire, was once one of the most significant towns on the River Meon, enjoying considerable prosperity and status during the mediaeval period, at least partly because of its port. 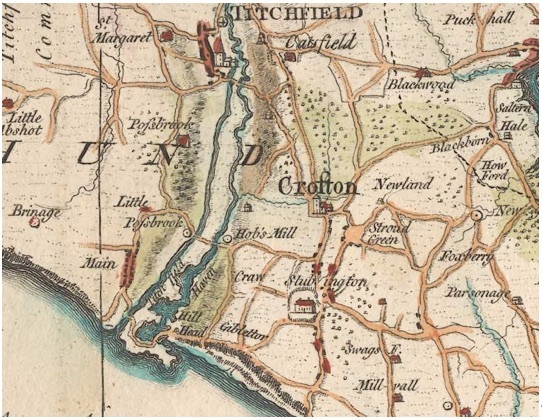 But, over time, as with many places whose fortunes rose and fell, Titchfield declined in importance, largely for social and economic reasons, but also partly perhaps because of its geography. Titchfield lies at the seaward end of the River Meon, and up until the mid-17th century, the town supported a small port. The woollen industry was important in the area around Titchfield, and mills along the river banks powered the production of iron, tanned goods, salt and cloth. The port enabled the goods produced to be distributed to larger centres such as Southampton, and also allowed the local gentry to move around by boat instead of travelling by road. 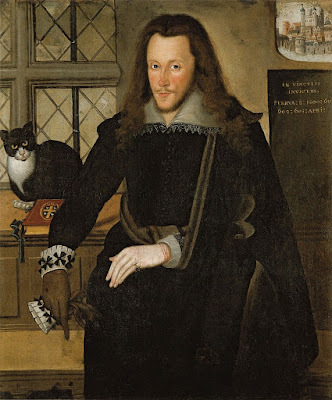 But, in 1611, the life of Titchfield as a port began its decline when the estate owner, the 3rd Earl of Southampton, Henry Wriothesley, blocked off the estuary of the River Meon and built a canal directly from the sea to the town. These actions were intended, presumably, to maintain the port, in the face of the silting up of the river mouth, but it is generally considered that, in practice, what he did rather hastened the decline of the town’s prosperity. despite it being the year that the river was blocked off and the canal built. The River Meon had been important for millennia to the groups of people who lived in its vicinity, as a source of water, undoubtedly, and food, perhaps, and also as a route through the woodland of Neolithic Britain (c.4000-2000BCE), and a means of transporting goods upriver from the sea. In due course, the river’s tidal estuary also made it suitable for water-powered industries to grow up along its banks. 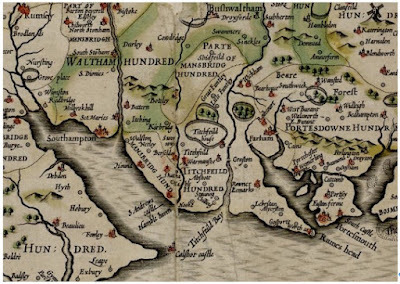 In the 10th century, Titchfield was referred to in documents and maps as Ticcefelda, in the 11th century, Ticefelle, in the 13th and 14th centuries, Tichefelde, and by the 16th century, the town was documented as Tytchfelde. “Menestoches”, by the way, is Meonstoke, 12 miles or so further up the Meon valley (and more or less where my fictional “Meonbridge” lies). A port of some kind seems to have existed at Titchfield, with the River Meon possibly serving as an industrial and commercial waterway, since the turn of the first millennium CE, when the river was still easily accessible from the sea. Such a port may not have been all that sophisticated. It is likely that large ships would have just anchored up outside the mouth of the river to unload their goods into little boats, which would then have ferried them to the bank and, perhaps, a little further upriver. It is thought that, prior to the 10th century, the River Meon was negotiable by small boats along most of its length, making it a viable alternative to road travel through the area. But the late 10th/early 11th century was the start of the construction of many water mills all along the river, mills that were used mainly for grinding corn but also in other industries, such as wool and cloth, iron, tanning, and salt. 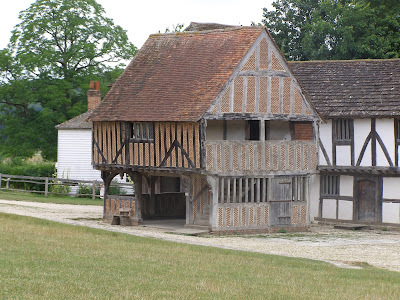 The mill at Titchfield, mentioned in the Domesday Book, was worth 20 shillings, but there were as many as thirty mills along the river’s length, and they underpinned the area’s economy for the next thousand years. However, it seems that, over time, the very development of the mills, and the associated bridges, weirs and other engineering works, especially those further towards its source, meant that river travel beyond Titchfield became difficult and eventually impossible. Sometime also in the 10th/11th centuries, Jean de Gisor, a rich Norman merchant, and a vassal of the kings of England, first Henry II and then Richard I, seems to have established a base at his property in Titchfield, in order to facilitate his cross-channel trade, implying the existence of a port that de Gisor hoped to exploit. Titchfield’s location would also have provided a good stopping off point for officials travelling between England and France, and a family like the de Gisors would certainly have attracted a wide array of important visitors, wishing to make use of cross-channel travel facilities. However, by 1180, the de Gisors had already moved on, to found the city of Portsmouth, and, presumably, develop its much bigger and more viable port. One can only speculate, but perhaps de Gisor found that the silty mouth of the River Meon was not as suitable as it might be for the establishment of a really successful port. However, a century and half later, in 1232, the Bishop of Winchester, Peter des Roches, established a Premonstratensian abbey at Titchfield, which, perhaps because of its high social and political standing, in itself resulted in significant economic development both in the town and the surrounding rural landscape. re-erected in 1970 at the Weald and Downland Open Air Museum, West Sussex. Titchfield already had a valuable market in 1086, as shown in the Domesday Book. When a town was granted a market or fair, it was a signifier of its importance. In fact Titchfield’s markets was one of the first in Hampshire and, by the 12th century, it was the only place in the Meon valley to have one. In the late 13th century, presumably after the establishment of such an important abbey, which was almost certainly visited often by officials and even royalty, King Edward I granted the town permission to hold an annual five day fair, which was of enormous economic significance. 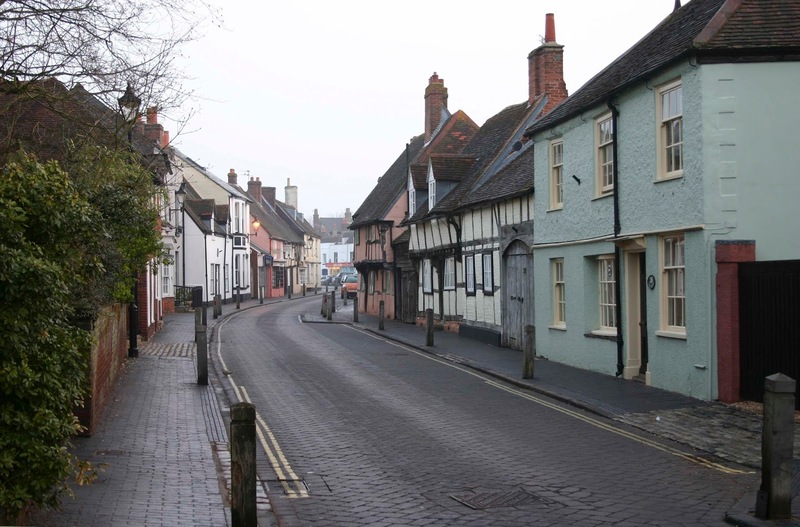 By the 1330’s, Titchfield was one of Hampshire’s richest towns, despite still being relatively small and, in 1333, it was also one of Hampshire’s most heavily taxed towns, implying that it was both thriving and important. However, the town suffered excessively in the Black Death of 1349‐50. The population was substantially reduced, perhaps by as much as 80%, and during the plague’s recurrences in subsequent decades, the tenant population of Titchfield was depleted still further. This dramatic demographic shift must have had a significant economic impact on the town. Before the Black Death, prices were high and labour abundant, and landowners grew rich. But the huge loss of life severely affected the production of key exports such as wool, and the reduction in labour, demands for higher wages and the excess untenanted land unbalanced the economy, at least for a while, with estate owners finding their incomes falling and trade presumably not so buoyant. The Hundred Years War (1337-1453) presumably also had an adverse impact, with the inevitable restriction of trade between England and Europe, and the burden of taxation imposed by the government to fund the king’s armies. The abbey was abandoned by the Premonstratensian order following Henry VIII’s dissolution of the monasteries in 1537, but the estate and the monastic buildings were quickly taken over by Thomas Wriothesley, who was granted the abbey and estate for his services to the Crown during the dissolution. Thomas was a member of the royal secretariat, and helped secure the king’s divorce from Katherine of Aragon. He was knighted in 1540, and became 1st Baron Wriothesley in 1544, when he also become Lord Chancellor. He was created 1st Earl of Southampton in 1547. In 1542, Thomas had the abbey buildings converted into a home, known as Place House, some parts of which can still be seen (managed by English Heritage, http://www.english-heritage.org.uk/visit/places/titchfield-abbey/). old gate house from Place House, which was owned by the Wriothesley family. Titchfield continued to be prosperous for some further decades but, as already mentioned, the mouth of the River Meon had always been “silty” and, in 1611, the situation became so bad that the 3rd Earl, Henry Wriothesley, Thomas’s grandson, took action. 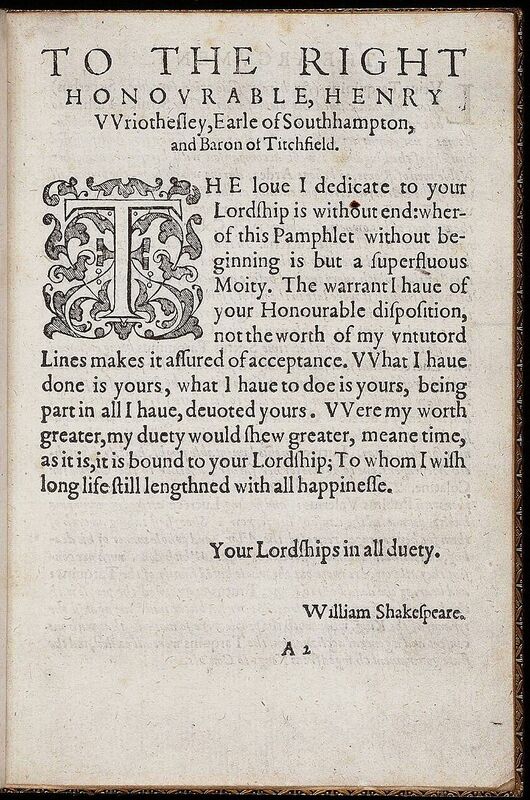 "The love I dedicate to your lordship is without end ... What I have done is yours; what I have to do is yours; being part in all I have, devoted yours"
to Henry Wriothesley, Earl of Southampton and Baron of Titchfield. in 1603, attributed to John de Critz. Henry was Shakespeare’s patron and it seems that Henry may indeed have been the “Fair Youth” of Shakespeare’s Sonnets, though he is not the only candidate! However, he appears also to have been a rather disreputable fellow, despite his high status, getting into scrapes of various sorts, one of which so upset Queen Elizabeth that she refused to receive him at court for a while, though his banishment did not last, so perhaps he was silver-tongued as well as handsome? Anyway, in 1611, Henry took the decision to block off the estuary of the River Meon from the sea, and build a canal adjacent to the river, one of the very first canals to be built in England. A sea lock was built across the estuary, thus removing the port. The sealock would control the passage of ships to and from Titchfield, but would also control the freshwater levels in the area, for a further objective of the scheme was apparently to reclaim the large stretch of sea-marsh lying between the town and the blocked-off estuary (now, the haven) for, one supposes, arable farming and sheep rearing to supply the woollen industry, which was perhaps seen as of greater value to the local economy than the river itself. The canal was built, presumably, as an alternative to the river, providing a direct link from the town to the sea, and to replace the functions that the River Meon had supported. It was evidently, however, not very successful in the long term and a hundred years later it was no longer in use. Interestingly, before he blocked off the estuary, the Earl established an iron mill, powered by the River Meon, which surely suggests that he expected his actions over the port to support, and even boost, Titchfield’s prosperity? And, over time, that mill did produce a huge quantity of iron. 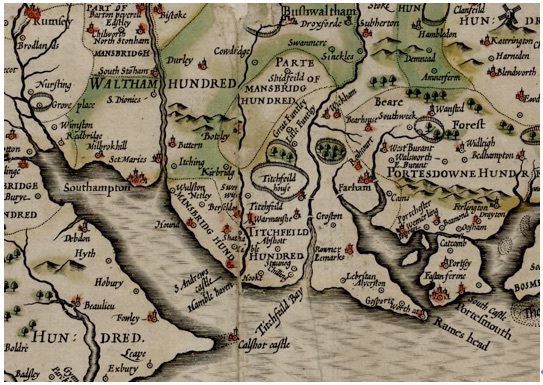 Wool, cloth, salt, and leather also still kept the town a viable trading community, but perhaps, ultimately, Titchfield could not keep up with the productivity and connections of the larger urban centres to the east and west – Southampton, Fareham and Portsmouth. So, although industry in Titchfield didn’t just fall away immediately following the closure of the river port, at length the importance it had once held did decline. 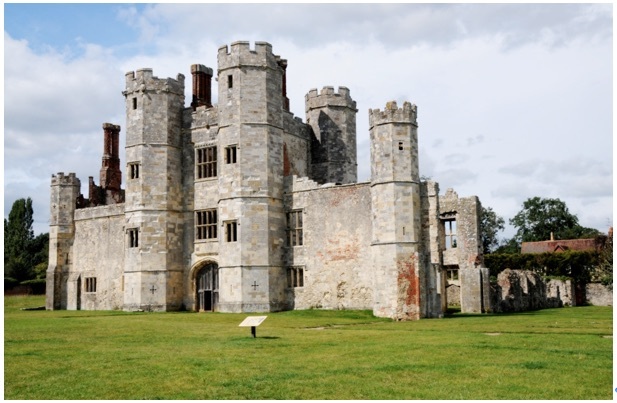 and the adjacent canal running up to Titchfield Abbey/"Place House". suggesting that the canal no longer flows into the sea. It is probably unjust to lay responsibility for the downfall of Titchfield’s economic health at the door of the 3rd Earl – though some do – when it seems that he hoped his engineering works would be the town’s salvation. But perhaps factors simply conspired, over time, to bring about the decline in the town’s importance. The silty nature of the lower River Meon, the industrial development along its banks, and then the Earl’s attempts to overcome its natural limitations, together with the lingering social, political and economic effects of plague and war, eventually reduce the town’s ability to sustain a port and, finally, its trading prosperity. Some of the discussion as to the background to Titchfield’s decline I shared during the writing of a Masters dissertation, The Economic Significance of the old port at Titchfield Hampshire, by Rosalind Hughes, which was submitted for a Masters degree in Maritime Archaeology at the University of Southampton in 2011 (unpublished).